The chicks I was forced to hatch in January due to the loss of my best rooster are a month old now. There are nineteen babies. 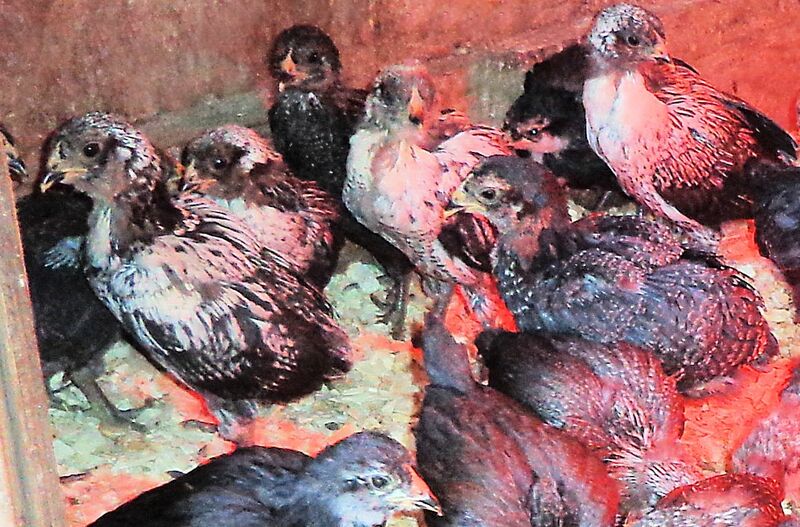 One died at day three, a common time for newly hatched chicks to perish if they have an internal birth defect. The rest of the flock seem to be doing well. The first month of their lives was spent in cardboard boxes in our house. Their lives began in a bathroom in two joined boxes with a 60W light bulb for warmth. At two weeks they outgrew that space. I moved them to two larger conjoined boxes in our unheated woodshed. With foam board insulation around the boxes and a 100W bulb they kept warm. When the temperatures dipped below 30F in the woodshed I ran an electric space heater. The babies thrived and grew quickly. 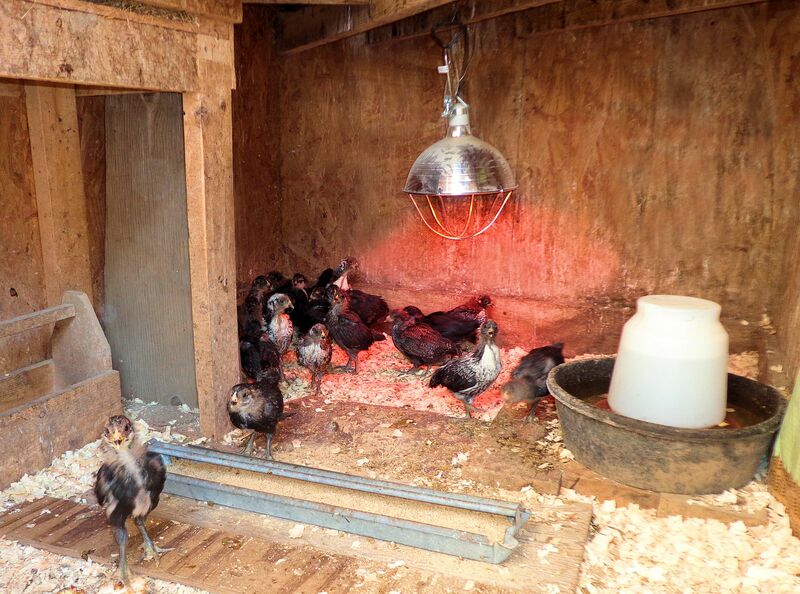 Two days ago we moved them outside to an insulated hen house. I’ve sealed all the windows and doors with plastic sheeting, used plywood to create a space with a ceiling about three feet high, and installed a 250W heat lamp. At night I close off the heated area with plastic burlap to a space about 3 ft x 5 ft under the lamp. Their water and food are inside with them. So far they have stayed warm and their water hasn’t iced up. We are lucky to be in a thaw period with temperatures in the 40sF during the day and no colder than 15F at night. The little guys are growing fast, making more insulating feathers by the minute. They love the freedom of forty square feet of floor during the day. I can hear them chirping away as they romp and flutter about in the hen house. 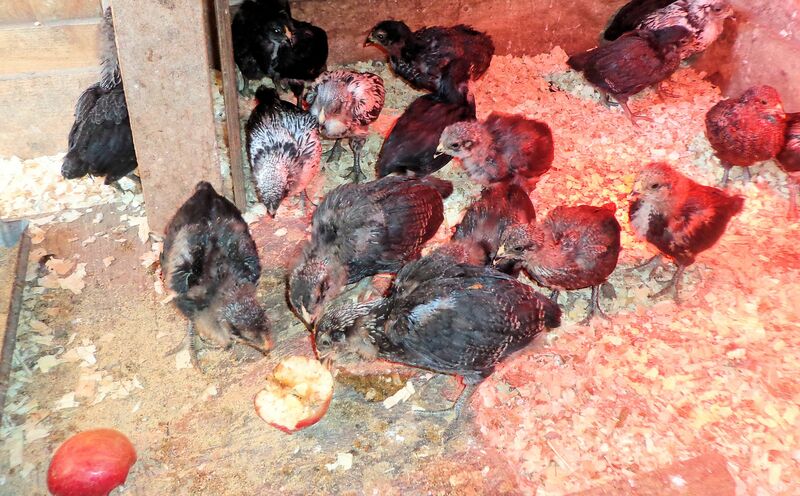 Chickens love apples and these babies are no exception. They will peck a whole apple away in a day. They also quickly learned to drink from a pan. I teach all my baby chicks to drink from a pan by placing the beginner waterer they first learned to use inside the pan. In no time everyone drinks from the new water source. They eat chick mash like little feathered piggies. 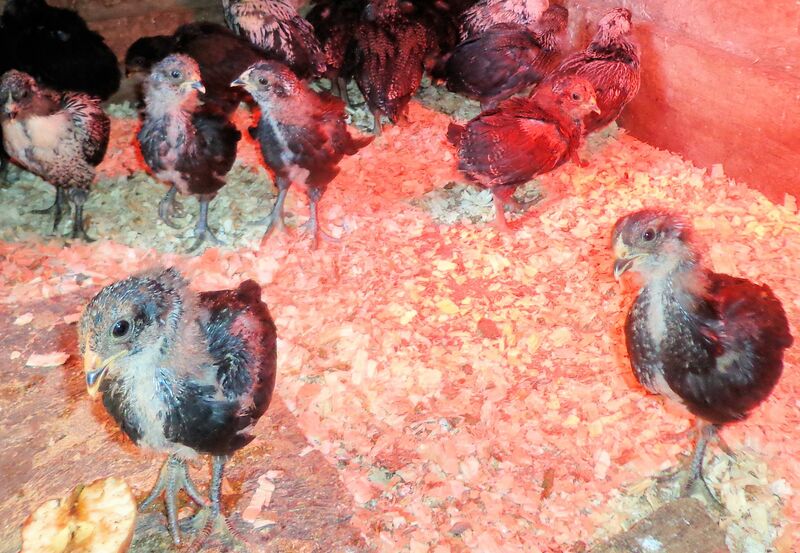 These winter necessity chicks were a real burden to raise in the house, but I think the effort will be worthwhile. At least four of the babies appear to be little roosters that look very much like the father we lost to a weasel back in December. They are silver splash in color with lots of white on their breasts and body feathers. I am hoping to produce some laced chicks from the splash color. Although splash and laced are not accepted purebred Ameraucana chicken colors, I find the laced coloration very beautiful. Each white feather has a band of black around the outside edge. So, if I’m lucky, breeding the splash color may result in laced babies one day. Hopefully on a nice warm spring day and not in the depths of winter!